I recently had the pleasure of meeting and talking to one of the co-owners of Juice Truck, Ryan! I also briefly met Zach, Ryan's partner in crime and the second mastermind behind Juice Truck. The entrepreneurial duo are some of the most down to earth, sweetest and coolest dudes I have met in a long time! Plus, they allowed me to pick their brain on what makes Juice Truck the amazing Juice Truck! I wanted to know what sparked the start of Juice Truck. 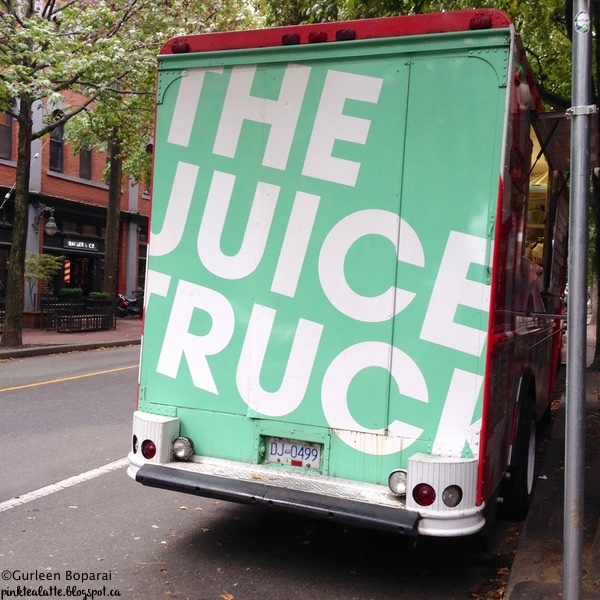 How did the iconic Juice Truck come about? Considering when they started, Cold Pressed juice was only starting out in LA and New York. Vancouver had yet to even hear about cold pressed juice. The two have been best of buds for over 10 years, working many Summer's together at Zach's father's company. So it is no surprise they went into business together. But how did they start Juice Truck? It actually came about quite organically. They both had been traveling together in Nepal and India. In both places they saw juice was such an integral part for the communities. In Nepal, SeaBuck thorn is commonly used to make juice as it contains many fabulous nutrients, Omega 3/6 as well as Vitamin C. It was so nutritious that many people in Nepal even used the Juice as a meal replacer. In India, the two noticed that juice actually brought communities together. Orange juice is commonly squeezed fresh roadside where people would gather about and drink it together. Juice is a nutritious and very affordable drink for the people. In fact, when Ryan and Zach were budgeting their daily food spenditure, fresh pressed juice was always included! When the duo came back to Vancouver, they wanted to bring healthy nutritious juice to consumers. After much research, cold pressed juice seemed like the best fit as it is the best method to preserve the vital nutrients and enzymes. Just a little on what it means to cold press juice versus regular juicing. Unlike other juicing processes, cold pressed juicers keep everything cool during the process. Why is keeping the fruit/juice cool so important? Enzymes are made of proteins that will denature when they are exposed to temperatures above their optimal range. Therefore, if you add heat to the juicing process, you are essentially killing off beneficial enzymes! Another big difference is that cold pressed juicers are very efficient at extracting the most amount of liquid possible. It is done through first grinding all the fruit/vegetables added to the machine into a pulp. The pulp is then pressed between two cooled pieces of metal. A process similar is how olive oil is extracted from olives! I was curious to know what was Ryan's favourite cold pressed juice. The Green Juice with Cilantro and Ginger is his go to drink! But we already know their current juices are fabulous and amazing, so did they ever end up making a juice while experimenting that was just downright awful? YUP! They did! It was cold pressed Durian Juice and practically no one could stomach it! So Durian is not cold press friendly! I hope you all got a little more insight on what makes everyones favourite cold pressed place, Juice Truck, so fabulous! I want to hear from you what is your favourite juice at Juice truck!